Episode 085 – For all the YANA Lovers Out There? After hosting four (epic!) back-to-back special episodes, Jamon takes a well-deserved break, handing the reins over to Q, Elise, and Damien Shields, who catch up on more than a month’s worth of MJ and Jackson Family news. 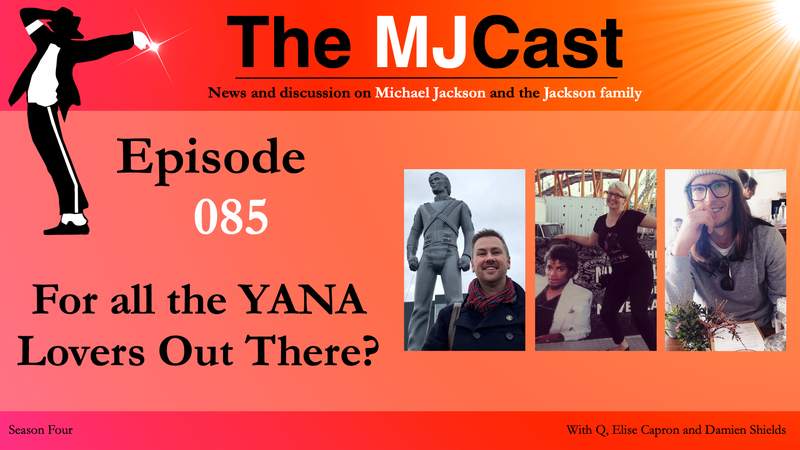 They revisit The MJCast’s recent interview with Judith Hill, and look ahead to events planned for MJ’s birthday on August 29th, including a screening of Moonwalker at the British Film Institute, as well as developments around the Estate’s ‘Diamond Celebration’, which include partnering with The Elizabeth Taylor AIDS Foundation and the release of a vinyl anthology box set. In other news, Michael has been making appearances on tracks by major recording artists, including Christina Aguilera’s ‘Maria’, and Drake’s ‘Don’t Matter To Me’, which has earned Michael Jackson his 30th Hot 100 Top 10 Billboard hit. Plus, developments are in the works for a Broadway show based around Michael’s music, and Omer Bhatti reveals the long-rumoured original golden Invincible album cover artwork. In Jackson family news, Janet continues her big year by receiving the first ever Impact Award at Radio Disney Music Awards, and reports are circulating that she is collaborating with Bruno Mars, Jimmy Jam and Terry Lewis on her new album. Lastly, be sure to check out the Michael Jackson Academic Studies courses, which have recently been made available for free online. Q and Elise also get a chance to ask Damien about the revised and expanded edition of his book, Michael Jackson: Songs & Stories From The Vault (previously titled Xscape Origins), and about the progress on his “A Truth Untold” project. A new German-language book about Michael has been released, Make That Change: Michael Jackson: Botschaft und Schicksal eines spirituellen Revolutionärs (Message and Fate of a Spiritual Revolutionary) by Sophia Pade and Armin Risi. Reports are circulating that Janet Jackson is to collaborate with Bruno Mars, as well as Jimmy Jam and Terry Lewis for new album. New Christina Aguilera song, “Maria, featuring an MJ sample. The Michael Jackson Estate is set to partner with The Elizabeth Taylor AIDS Foundation for Michael’s “Diamond” birthday celebration. Janet Jackson receives the first ever Impact Award at Radio Disney Music Awards and gives another inspirational acceptance speech. A Michael Jackson Broadway show may be coming in 2020, organised by the Estate and Columbia Live Stage. New Drake song with previously-unreleased MJ vocals, “Don’t Matter to Me“, which has earned Michael his 30th “Hot 100 Top 10” Billboard hit. London’s prestigious British Film Institute has announced a screening of Moonwalker on August 29th for Michael Jackson’s birthday. The National Portrait Gallery has opened its Michael Jackson – On the Wall exhibition, which will be travelling to France later this year. Fashion house Balmain launches its Spring 2019 Menswear collection featuring Michael Jackson-inspired designs from designer Olivier Rousteing. SWG (Single White Glove) has released a new (10 minute long!) You Are Not Alone Extended Mix. Enjoy, YANA-heads! Omar Bhatti reveals the long rumoured original golden Invincible album cover artwork. MJAS have just made all their courses available for free. MJ60 Birthday events: What’s happening? Let us know details! Organise something yourself! Elise shares a few Los Angeles MJ Week stories. Damien Shields discusses his new edition of Michael Jackson: Songs & Stories From The Vault (previously titled Xscape Origins). Elise – MJ FAQ by Kit O’Toole.